YouTube Chart From YouTube-Know what's Popular on YouTube! 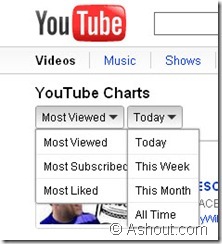 Youtube today added new feature called “YouTube Chart” in YouTube. With Youtube chart we can easily know what’s the popular video on youtube based on Most viewed, Most subscribed and Most liked videos. They also added an options to view based on days like Today,This Week, This Month and All Time options. Now we can easily find out which youtube video is rocking on youtube based on different options like views,subscribes and most liked. But what they have missed is, they didn’t add an option to know popular videos based on categories. For example If I want to see the popular video on How-To category then how can I see? still this option is not yet added, maybe we can expect this feature in coming days. See how popular videos based on Most Viewed and Today option displays result page. If you want to see popular videos on youtube then head over to Youtube Charts page. This feature will make youtube more user friendly. Thanks for sharing this.